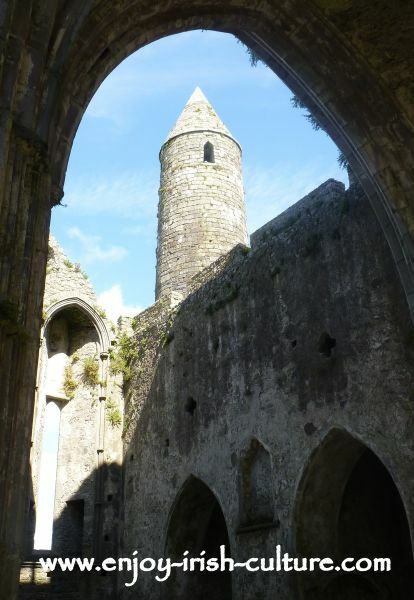 My aim on this page is to bring alive the lifestyle at the Rock of Cashel during medieval times. Join me on the journey. The Rock of Cashel in Cashel, Tipperary, Ireland, is one of Ireland's best known heritage sites. The ruins visible here today speak of a blooming period of Irish history- of early Christian Ireland. I will start with an anecdote from the 15th century. The Hall of the Vicar’s Choral from that period, seen above, is the only reconstructed building at the Rock. It was a purpose built, privileged residence for eight members of the choir. Apart from the archbishop himself, the choir members had the most comfortable lodgings available including a large hall and spacious kitchen and dormitories and plenty of servants. 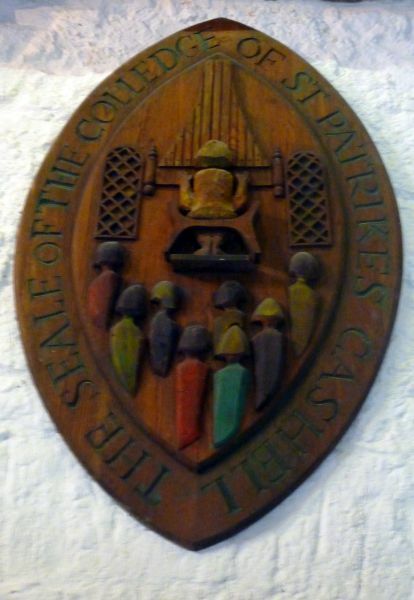 In fact, these men were so privileged that the archbishop gave them their own seal of office (seen below) which entitled them to purchase anything they needed or wanted in the town. As it turned out though- the archbishop was too trusting! The system was abused very quickly by the savvy choir members. Copies were made and the seal was passed on to family and friends. Within a year the system was done away with and the choir members were dismissed. The same privileges were never awarded again to a new choir. 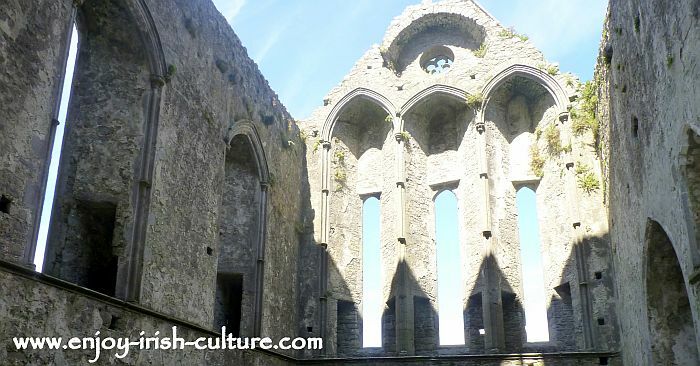 And for the rest of the people at the Rock of Cashel- what was life like for them? Far from the comfort one imagines at the residence of an archbishop, the Rock of Cashel was a rough place to live, very cold and exposed in winter. There was no well. All water, food supplies, building materials as well as firewood or turf had to be brought up the hill. And the hill was too steep for the use of horse drawn carts. For those in the service of the archbishop, first and foremost this meant a lot of hard physical work. What did people do for their toileting needs? What did people do for their toileting needs? I asked the guide. I am always interested in the basics. It's not just a 'weird obsession' though. I reckon that the state of toileting facilities tells you an awful lot about a culture or time. 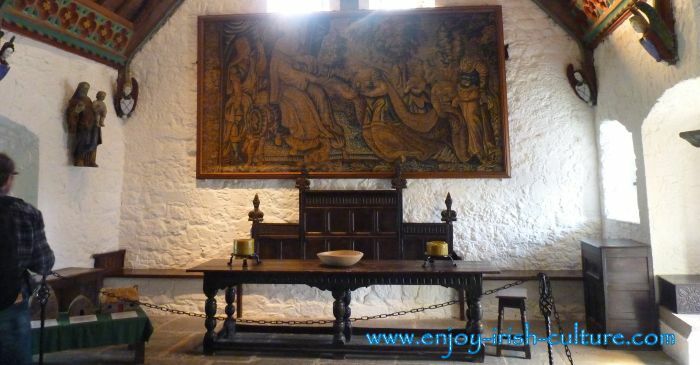 I was told that there were no garderobes at the Rock which provided relative comfort where they existed in medieval castles and monasteries around the country. At the Rock, toileting happened with the use of buckets and in the absence of flowing water anywhere nearby, the waste had to be emptied over the wall to accumulate in the fields beyond. You can imagine the lovely aroma in the air that people had to live with. The Cathedral at the Rock of Cashel was built between 1230 and 1270. A unique and notable feature of the Cathedral is the Archbishop’s secret passageway.You can still see remnants of it if you look on the left hand side in the photo underneath. See the little 'doorways'? That's it. The Archbishop, who lived in a tower house castle on the site, had a secret passage way from there into the top of the Cathedral well above his parishioners. In parts of the passage way he could make himself visible to the crowd or to his priests, in other parts he would be hidden from view but able to listen in on proceedings below. You can imagine both the awe and the level of fear this power would have instilled throughout the eccasiastical community. The secret passage was defended with some typical medieval defences used before the onset of firearms. In this case, stumbling steps were used that were meant to trip up any attackers. Stumbling steps were secret humps, bumps and dips along the passage way. The Archbishop knew where they were, but any potential attacker did not. The attacker would be at a serious disadvantage if he was thrown off balance while swinging a sword. There was a murdering hole also which the archbishop could use himself directly from his living quarters. Was the archbishop prepared to defend himself with weapons? You are catching on fast. Medieval Ireland was a very different world! Back then, the boundary between world powers and church powers was rather fluid. 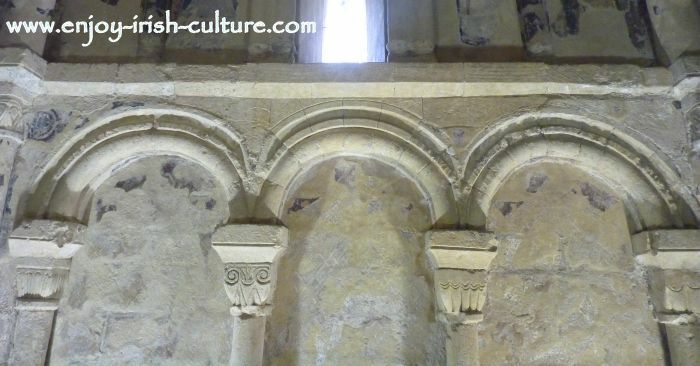 A number of the Kings of Cashel doubled as powerful figures in the church. In medieval times, it was quite common for men of the church to take part in warfare. They were not allowed to draw any blood, but they might use weapons that would smash an opponents’ skull instead, which was seen as quite acceptable! Wall detail in Cormac's Chapel at the Rock of Cashel shows ornate carving and remnants of ancient frescoes painted with the best of imported materials available and laid down by master craftsmen from abroad. The round tower at the Rock of Cashel dates back to 1101. It is one of the best preserved round towers in Ireland standing 28 metres tall, with a diameter of 8 metres at the bottom and 7 metres at the top. These towers were a feat of construction. Built by master craftsmen they have lasted some 1,000 years so far. Round towers are unique to Ireland. But what was their use? Round tower at the Rock of Cashel. See more round towers here at Clonmacnoise. What Were Round Towers Used For? A few different theories have been put forward, such as a use of the round towers as a hiding place for monks and priests during times of attack, (such as by Vikings), the use as a storage facility for precious shrines, crosiers, chalices and similar items belonging to the religious site, and their use as watch towers to ensure safety of the facility. Recent thinking by historians has turned more towards the mundane, seeing their everyday function first and foremost as bell towers, and as a landmark that makes an important religious site very visible in the landscape. The look out and storage functions may have gone along with that, but it is unlikely that the towers ever served as hiding places or shelter for monks for when the monastery was under attack. When you really think about it, they would not have made for a safe or effective hiding place. Even though the doorway was located high up and might have been difficult to access for attackers, it could have been set on fire quite easily with burning arrows. You can imagine what a fire would do inside a tall structure like this- the tower would act like a chimney and the wooden floors and stairs inside would be set alight in no time. If you liked this article about medieval life at the Rock, please interact with us some more: Give us a Facebook comment underneath, or alternatively like or share us to your timeline by using the social buttons at the top left.